Ocean Doctor’s “50 Years – 50 States – 50 Speeches Expedition” is a journey of outreach, education, and discovery announced by Dr. David E. Guggenheim on his 50th birthday to bring at no charge speeches and multimedia education programs about the oceans to schools in all 50 U.S. states and 5 inhabited U.S. territories. 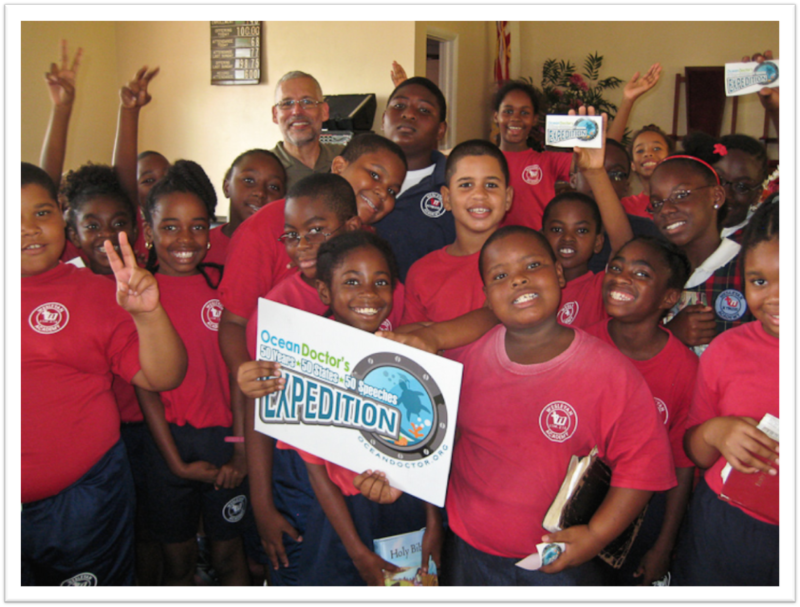 By its culmination, the expedition will reach more than 100 schools and tens of thousands of students, with whom the “Ocean Doctor” is sharing firsthand accounts and important lessons about the oceans and their conservation. The expedition is also promoting renewed interest in science and science careers among the students visited. Finally, the expedition is collecting thousands of messages from the students to be delivered to leaders in Washington, DC at the conclusion of the journey. Years ago, an article appeared in the Palm Beach Post quoting me as saying, “The leaders we have to reach are in diapers today.” I was referring to the largest environmental restoration project in history — the Everglades — and the fact it would take unwavering dedication and stewardship over decades to ensure its success, speaking in my former role as president of The Conservancy of Southwest Florida and co-chair of the Everglades Coalition. I suppose those once-diapered kids I was referring to are now in high school, which is why I was intrigued to hear explorer Scott W. Hamilton, speaking at an annual gathering of the Explorers Club, state that “the next commander of a manned mission to Mars is in elementary school today.” The daunting challenges ahead of humanity — whether restoring ecosystems, saving coral reefs, battling climate change or holding the first handful of red sand on Mars — are decades-long efforts that can’t rest on the shoulders of a single generation. So is the next generation more ready than we were to take on such challenges? I’m in the process of finding out. 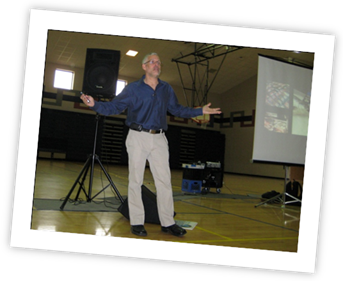 I’ve been on the road constantly, giving speeches to K-12 schools in what I hope will soon be all 50 states plus U.S. territories. 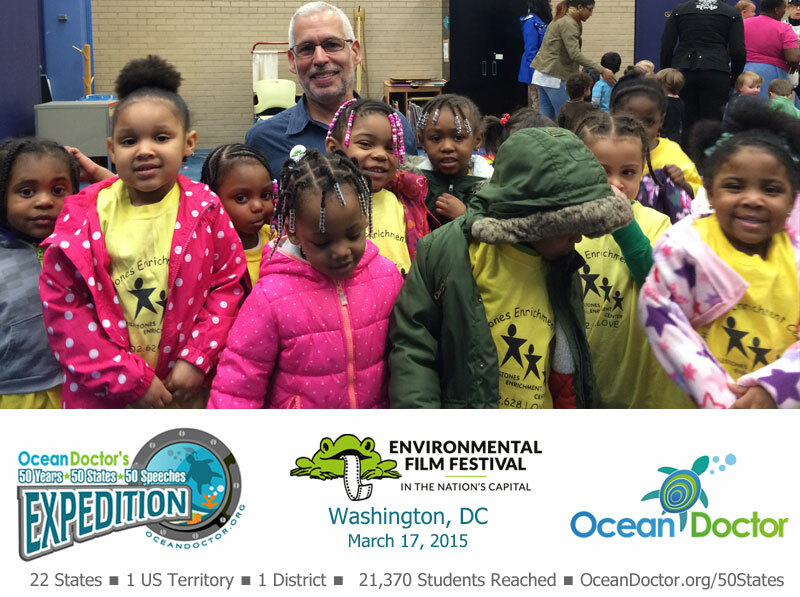 So far I’ve reached thousands of students and taught them about the wonders of the ocean and the threats it faces. What began as a deeply personal quest to celebrate my 50th birthday and honor the memory of my father (who shared his love of the ocean with me but was lost at sea just before his 50th birthday) has evolved into something much more. As I’ve listened to students’ cheers, applause and even shrieks during my presentations, spoken with them individually and looked into their wide, excited eyes, it’s become clear I’ve tapped into an enormous, pent-up passion, fascination and love of the oceans that I must admit even I had underestimated. Such enthusiasm is incredibly strong even among the thousands of students I’ve visited that have never seen an ocean. I’ve had similar responses from the teachers (well, except for the shrieks), some of whom were furiously scribbling notes as I spoke. They later told me how much of what I presented they never knew themselves and that they intended to incorporate it into their curriculum. I’ve met some incredible teachers and seen firsthand their extraordinary achievements and selfless dedication to bringing the gift of a strong science education to their students, often amid massive budget cuts and maddening administrative bureaucracies. There is an incredible thirst among today’s students for clues to the mysteries of the oceans, how those blue waters affect their lives and vice versa, and what exciting, rewarding careers await them in science and especially, marine science. Unfortunately, few of these children are getting from their standard curriculum. I’ve been humbled by seeing that there are legions of natural allies for the cause of ocean conservation out there, students and teachers alike eagerly asking what they can do to help. Ocean Doctor’s “50 Years — 50 States — 50 Speeches Expedition” takes me back to my roots as a marine science teacher and I still find it every bit as fulfilling to watch young eyes widen, perspectives change and horizons broaden when the students I visit with learn about the sea and its mysteries. It is also gratifying to realize that a 50+ year-old ocean doctor is capable of learning so much from the students and teachers he encounters, and that his heart capable of being deeply moved by the faces, lives and stories he encounters on his journey. 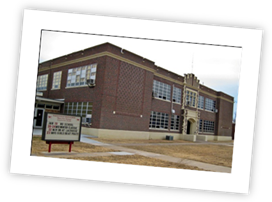 I visited a high school of just 100 students in Kansas, not far from the geographical center of the lower 48 states, a community that had recently been devastated by two killer tornadoes. They apologetically referred to their community, Macksville, as being “in the middle of nowhere.” But after spending the afternoon with some delightful high school students, I came away with a very different opinion of a remote but remarkably resilient place where the terrible tragedies of two years ago had brought their community together like never before. To me, it most definitely felt like a “somewhere.” The students shared with me their love of nature, mostly hunting and fishing among local lands. Their experiences were vastly different from mine, but we shared a great appreciation for the outdoors. In the shadow of Mt. 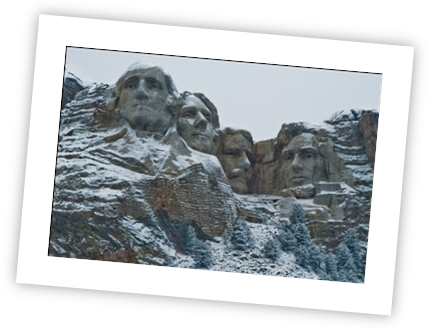 Rushmore, nestled within the Black Hills, I visited the massive Central High School and its 2,300 students in Rapid City, South Dakota. I had fascinating discussions with the faculty, discussing the importance of such exchanges and how much we still have to learn from each other across such a large and diverse country. It’s not only the oceans that we need to learn about. The assistant principal told me that a few years ago, a fellow teacher from an eastern city had asked her if Indians still live in tee-pees in South Dakota. She informed the individual, “No…they live in houses.” She still can’t believe that such a question could have been asked by a teacher. 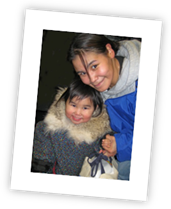 Stranded for two days in Fairbanks, I befriended Eskimo families who were also stranded, and learned about their ways, history, and intimate connection to the sea. Finally making it to my destination — the northernmost settlement in North America: Barrow, Alaska. I spent the day with three delightful fourth grade classes, some of them relatives of the families I had met earlier. While outside the temperature plunged to -43 degrees F, the children told me about their customs, including the annual whale hunt. 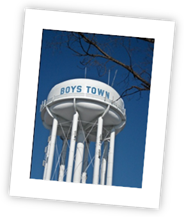 I spoke to at-risk middle school boys and girls at Boys Town, Nebraska, the school made famous by the 1938 film and from where the famous expression, “He ain’t heavy, he’s my brother” originates. It is a school that continues a rich tradition of helping these children reach their potential. I visited Elkhart, Indiana as part of an enormous community science/Halloween event known as “Science Spooktacular,” where more than 3,000 students from the area come out to learn about the wonders of science, planet earth, and this year, the oceans. Thanks to the wonderful leadership of Elkhart-based ETHOS (Encouraging Technology and Hands-On Science), the event was a great success and an inspiration to communities across the nation on how to engage schools, students, families and the broader community for an event that’s truly educational and fun. The event was especially inspirational as Elkhart, Indiana has been one of the hardest hit by the economic crisis, at times topping the national unemployment figures with a rate as high as 16 percent. Pulling off a successful event under such conditions was a monumental feat. I’ve taught the students I’ve visited about the connections they have to the oceans, even if they’re living more than a thousand miles from the nearest salt water. I’ve shown them how 95 percent of the ocean has yet to be explored, and how it will soon be their turn at the helm — our next Lewises and Clarks! I’ve showed them how their landlocked farming communities might just be farming marine fish some day soon in high-tech, land-based recirculating aquaculture systems, which are a more sustainable alternative to depleting wild fish stocks. And I’ve given them a peek at the next-generation of technology that will take them to the bottom of the sea in Ironman-like pressure suits and deep-flying subs that resemble jet aircraft. A central theme is that careers in science are important and exciting. The Ecology Club at Morrow High, Georgia. The school has had no field trips for 5 years. The Ecology Club at Morrow High, Georgia. When I visited I was told the school had not had a single field trip in five years. Just as I’ve been pleasantly surprised by the wild enthusiasm and love for the oceans, I’ve been troubled to see that such emotions are often accompanied by a nearly equal level of fear. Two young girls in Nebraska didn’t raise their hands when I asked who had never seen the ocean but wanted to. I asked them, “Why not?” They looked at me in disbelief that it wasn’t obvious to me. “Sharks,” they said in unison. 6th Grader Shelby’s petition made it all the way to the U.S. Senate! Fortunately, much of what I’ve learned has been positive and uplifting. Having spent very little time in the Midwest myself, I’ve been struck by the strong environmental spirit among many students there, born from the many hours they spend outside hunting, fishing and just plain hanging out. They haven’t needed an ocean in their back yard to ‘get it.’ I’ve seen a growing number of students involved in a new generation of green activities, such as ecology clubs and recycling clubs. I haven’t seen this level of interest or engagement since the first Earth Day! I was especially inspired by a sixth grader near Atlanta named Shelby, who started a petition against shark finning, the cruel and unsustainable practice of slicing off a shark’s dorsal fin for shark fin soup, a practice that kills the animal. Her petition made its way all the way to the U.S. Senate in Washington, DC. My work only begins when I complete a speech at a school. I am filling 50 bottles (representing each of the 50 states ) with messages from the students I visit, expressing their thoughts, hopes, and dreams about our oceans. I have promised to deliver these bottles to the Administration here in Washington at the completion of the expedition. I’m also building a growing online network to connect all of the schools I visit to allow them to share their experiences and perspectives with one another, create their own ocean blogs, and interact with ocean experts to get advice about colleges and careers in science. 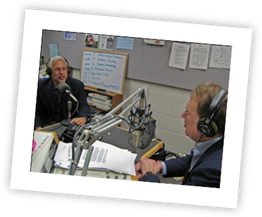 I’m giving radio and TV interviews along the way to build awareness about our oceans and science education. 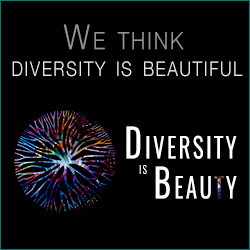 And I’m sharing my experiences through speeches at science, education and conservation conferences, and through posts, social media and imagery. I know from my own experiences as a young teenager discovering marine science that the right kind of education experience can leave an enduring awareness and appreciation of the environment and its fragility. 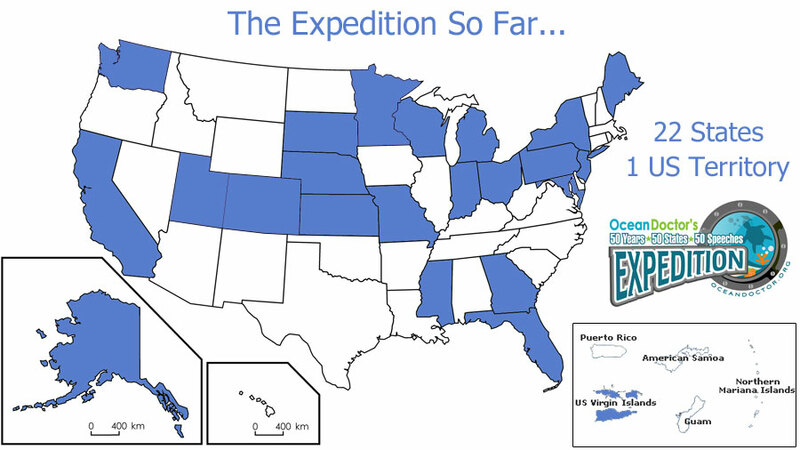 Please accept my invitation to join the expedition as one of its supporters and help me continue this unique and important journey of discovery and education to all 50 states. 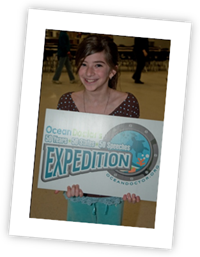 Your donation to Ocean Doctor’s “50 Years – 50 States – 50 Speeches Expedition” will ensure that I can continue to bring the awe and wonder of the ocean to students across the country, and bring their stories to you. Please help me continue to find the ocean in all of US. On behalf of the thousands of students who will get a chance to learn about the oceans and a future in science, please accept my sincerest thanks. Please help us complete this important journey and reach thousands more students. Our students thoroughly engaged with Dr. David Guggenheim. His presentation was captivating and his message of greatest importance. He brought science to the top of many student’s lists of what they would like to do in their future work. Our students from 1st -12th grades were truly touched and positively impressed with the importance of our oceans and we all learned a great deal more about this huge part of our world and what is happening in them. 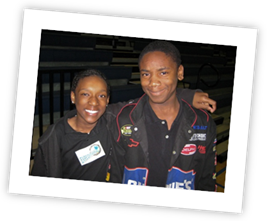 I highly recommend support of David’s program. 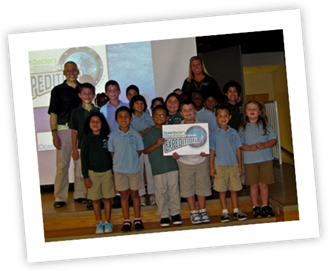 We regularly bring scientists, naturalists, and others to campus to speak to the University community and, in many cases, to talk to students at area schools, but we have NEVER brought in a speaker who has had the impact that the Ocean Doctor has had. It’s been a month since Dr. Guggenheim visited, and people are STILL raving about the talks he gave! Several long-time University folks believe that the Hefner Lecture he gave at Miami (he delivered the 37th annual Hefner Lecture on November 3rd) was the best Hefner Lecture ever! 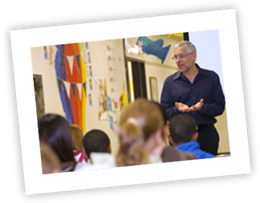 In addition to the Lecture, Dr. Guggenheim visited four schools in three days’ time, speaking to more than 350 grade school students. I’ve heard from many of those students, as well as from their parents, and the enthusiasm and excitement he generated are unbelievable. Dr. Guggenheim relates so well to young people. He shares his sense of wonder at the beauty and diversity of the oceans, his awe at what he’s seen and discovered beneath the waves, his excitement about all that is yet to be explored and learned, and his passion for protecting and restoring ocean systems. Don’t miss the opportunity to bring him to your school! We’ve just completed an amazing two-day visit by Dr. Guggenheim! He spoke to elementary students; college students and faculty; and a large general audience (where he received a standing ovation). Our varied audiences totaled into the several hundreds.We were particularly taken with how well he relates to young people. We gathered a group of 150 6th-graders from our public school system for his presentation. He gave them an exciting program, finishing by teaching them how to “drive” his min-sub — brilliant!) — they all raised their hands when Dr. G asked if they wanted to become scientists! Every school district in the United States needs Dr. G to come speak and motivate their students to go into the hard sciences. Our Council and community members think that he was one of the best speakers they’ve heard, and they are quite particular, as we bring in national experts throughout the year — we have a very active speakers program.Dr. Guggenheim is extremely gracious and generous with his time. We truly enjoyed his short visit with us and can’t wait to bring him back! Don’t hesitate to contact us if you would like any more testimonial. I’ve been bringing in speakers for over 15 years and he is one of the best! 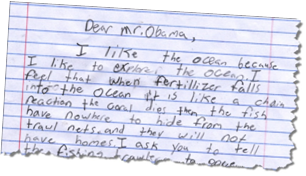 David engaged children – and adults – of all ages, communicating a message of passionate concern and involvement with the future of the oceans and the life it sustains. His visual presentation was witty, energetic, personal and instructive, all at the same time; and he introduced his audiences to new and real ways of looking at their own role(s) in marine preservation. His classroom presentations were relevant, focused and interactive. In all, David has made life-long friends at Friends Select School! Dr. Guggenheim gave a wonderful PowerPoint presentation with very vivid pictures. Our boys and girls were very interested in all he had to teach them about the ocean, coral and sea animals. What a fantastic day with the Ocean Doctor at Sassarini Elementary School in Sonoma, CA! The children were so amazed and awed by the video of octopus, submarines, coral, fishing boats, squid squirting ink on a submarine light, divers, Cuba, the Bering sea and Caribbean. It appeared to be the first introduction to the ocean for many of the children. Thank you so much Dr. Guggenheim for presenting at the assembly! It is greatly appreciated. There is nothing like seeing your students’ eyes light up with excitement. 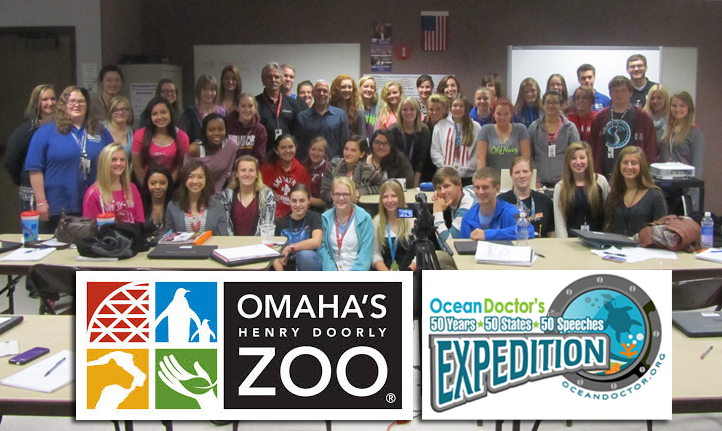 The Ocean Doctor showed my students a world of wonder and awakened a passion in them even they didn’t know they existed. Simply wonderful! With impassioned words and impressive pictures, Dr. Guggenheim was able to illustrate many of the issues the class was exploring–from overfishing to the effect of land use policies to our changing relationship with the creatures of the sea. His speaking engagement was an invaluable gift. It really is an amazing experience to be able to attend one of Dr. Guggenheim’s lectures and interact with him. His passion for his field is truly is infectious! He has reminded me why I chose my field of study and inspired me to really try and make a difference. He has opened up a view into a new world for me. I can only hope that I can find the same amount of passion for our planet and channel that into making a difference as well. Dr. Guggenheim was an enormous inspiration and a real role model, I feel, for the scientific community! I can never thank him enough for opening up my eyes to the ocean and re-inspiring me continue in my field of study!